We’re getting many emails and FB messages and posts to our wall about the closing of Brazoria County Humane Society. While we agree it’s an unfortunate situation, Rescued Pets Movement is sympathetic but unable to assist at this point in time. RPM is currently only able to fulfill our obligation to our partnership with BARC and the 1.2 million homeless pets in Houston at this point in time. Hopefully, as our organization grows, we’ll be able to assist in these types of situations in the near future. Let’s put the GIVING in Thanksgiving: 47 BARC pets saved. If you are able to temporarily foster and open your home and heart to any of these pets, PLEASE let us know. Contact us at foster@rescuedpetsmovement.org. PLEASE. If you cannot foster or donate, please don’t stress about it. Just PLEASE forward this email to all of your contacts and ask them to forward the email to all of their contacts. Every cent of your donation will go toward transporting these well-deserving pets, toward temporarily fostering a pet until he or she can be transported, or toward reasonable and necessary vetting expenses. Any excess funds we receive will automatically be applied to our next transport or BARC pull. Thank you so much for your help and your voice. Together we can make Houston a no-kill city. In our last post, we told you about RPM’s successful media launch. With so much activity surrounding the two vans, the media, and the many animals to transport, our photographer wasn’t able to get the photos and names of all 48 dogs and four cats. We never forget that these deserving pets are who we’re working for, so we wanted to share at least a few of their names and faces. A word about Jonah and the marks on his head. When he and his foster mom were on their way to the event, she stopped at her salon and of course took him inside with her. Her hairdresser covered his sweet head with kisses–and who wouldn’t? He’s wearing the traces of her lipstick. We love the BARC staff and our fosters, friends, donors, transporters, affiliate organizations, vets, boarders, and the people on the other end of the journey who meet and often photograph the dogs there. 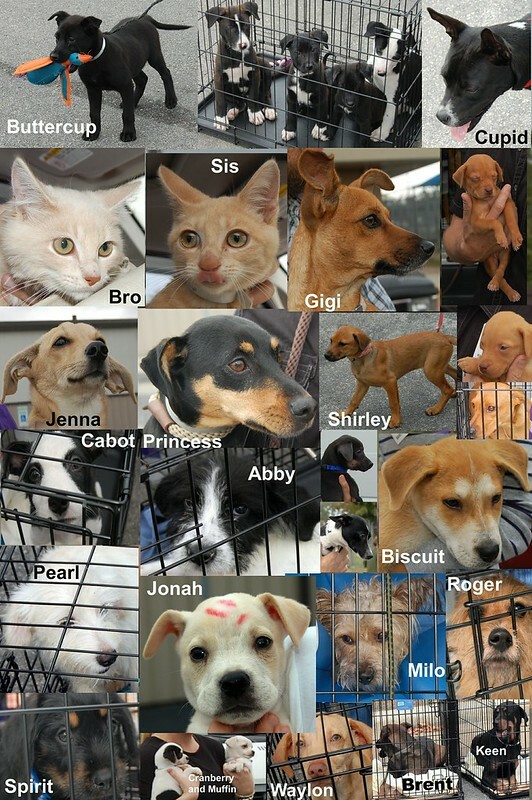 All the dogs and cats from this transport are now safe and sound in Colorado. Here are a few photos of their arrival. Thank you for making RPM and yesterday’s media launch a success. We at Rescued Pets Movement are extremely grateful for the support and encouragement we received yesterday from our volunteers, supporters, benefactors, BARC staff, BARC volunteers, and the members of Houston’s local news media who attended the launch of our organization and our partnership with BARC. Everybody came together to help us place fifty-five dogs and cats in two vans for transportation to rescue organizations in Colorado. The impact of seeing fifty-five dogs and cats with a renewed lease on life, how they represented future transports, the fosters and volunteers coming together to make it happen, and how RPM and BARC can work together to do the same for many, many more dogs and cats made for a very emotional scene. Despite our overwhelming emotions we managed to talk to the media and get the message out there about what RPM does and how we’re committed to reducing the euthanasia numbers for Houston’s adoptable pets. Thanks to our volunteers, fosters, benefactors, supporters, our friends at BARC, and the local media for helping us to make our media launch a successful and memorable day. More than that, we thank everybody for helping us send those fifty-five dogs and cats to Colorado yesterday. And we thank YOU for your continued support. Because of you, we were also able to move an additional twenty-eight dogs out of BARC as soon as the vans drove away. We’re getting ready for our next transport on December 6th! If you’d like to help us by donating, please visit our donations page or mail your donation to 3139 West Holcombe Blvd. #135, Houston, TX 77025. If you’d like to foster a dog or cat in your home until the next transport (THANK YOU!) please send your contact information to foster@rescuedpetsmovement.org. If you have another way you’d like to help us, or for more information or media inquiries, please contact us at info@rescuedpetsmovement.org. We’re excited to tell you that since our last post about the most recent transports, fifty dogs have been adopted! These are dogs who would have been euthanized but instead are now settling into their forever homes. Here are a few photos taken when the dogs arrived safely in Colorado to be greeted by rescuers, fosters, and adopters there. Thank you to everyone who helped get these wonderful dogs to Colorado, including those on the other end who are ready to welcome Houston’s dogs and cats when they arrive. Thanks also to Sarah Roshan for letting us share her photos. Rescued Pets Movement is thrilled to announce our LAUNCH WEEK. We promise this will be life-changing week for the homeless animals of Houston, and we want you along for the ride with us. Last week, with your help, RPM rescued 108 death row dogs and cats from BARC and sent a total of 146 homeless animals to rescues. And we are just getting started! For those hearing about RPM for the first time, this is what we do: There are an estimated 1.2 to 1.4 million homeless dogs and cats on Houston’s streets. The Bureau of Animal Regulation and Care (BARC), our city’s pound, takes in approximately 2,000 pets each month and is forced to euthanize half or more of that number. Through years of rescue work and building a large contact base around the nation, RPM has located highly reputable, no-kill, nonprofit organizations in other areas of the nation that actually need adoptable pets. RPM coordinates the rescue of highly adoptable pets from BARC, places them in temporary foster homes, and then transports these pets to those areas. Without available rescue animals, the public in these high-demand areas will turn to puppy mills and breeders, which makes no sense when Houston can readily supply adoptable animals. When RPM formed on September 23, 2013, we had no idea how well this program would succeed. Our initial plan with BARC was to transport 50 pets every other week, about 100 pets a month. That number would help BARC make an approximate 10% dent in its euthanasia numbers. We planned to slowly build the program so that, with better spay-and-neuter outreach, we would make Houston a no-kill city. The response from around the nation has been nothing short of amazing. Because of the generous support from personal donations from people in Houston and because of our fosters and volunteers, Colorado and other parts of the country have heard about what we’re doing, and RPM has been able to increase the number of transports to one or more each week. Our accomplishments are the result of an amazing act of teamwork — fosters inviting rescued pets into their homes, volunteers delivering BARC animals to their Houston-area foster homes, people donating money to make sure RPM stays afloat, the tireless work of BARC employees, and all of you who are spreading the word. RPM is proud to announce that, with your help, by this Thursday, we will have saved a total of 399 companion animals since we formed less than two months ago. And we’re just getting started. At this rate, we estimate that RPM is making up to a 50% dent in BARC’s euthanasia rate. We are over the moon with the progress you have helped us achieve in such a short time, and we want to celebrate that with you! On Thursday, November 21, RPM will have its official media LAUNCH LOAD at BARC. Beginning at 11 am, fosters, volunteers, and BARC staff will be loading three vans full of pets to transport them to better lives. RPM wants the media and all of Houston to know that a serious movement is happening. We would love for you to stop by and show your support. Then, on Friday, November 22, we will host our LAUNCH PARTY at Ibiza at 2450 Louisiana St. from 6 pm to 9 pm, where we will raise a glass to each of you for your support. We hope to see you there! Thank you so much for your help and your voice. We support coming together across the US and working together on a national level. Learn more about RPM at www.rescuedpetsmovement.org, and join the Movement to making Houston a no-kill City.